Realising the need for economic independence and the pivotal role men play in raising the standard of living of a vast strata of our society, Ajmer Institute of Technology, is providing career-oriented education to the students so as to equip them with requisite qualification and training. This institute of excellence aims at improving the quality of technical education to enable the students either to take up gainful employment or to start their own enterprise to gain economic prosperity. A well directed education is a passport to a good, comfortable and secured life. It will enable youngsters to become contributing members of society through their gained knowledge, skills and character development. Placements : The Placement Cell at AIT facilitates between the corporate and the student for recruitment. More importantly, it is geared to understand corporate requirements and develop students who are employable. In the 4 years of engineering at AIT, this is accomplished through 160 additional hours of targeted training. Our programmes are designed to improve confidence levels, analytical thought, presentation delivery, communication skills and technical know-how. AIT’s Placement Cell is supported by group discussion rooms, interview rooms, seminar halls, and more than 250 computers with 10MBPS dedicated internet and LAN connectivity that can be utilised for online tests. 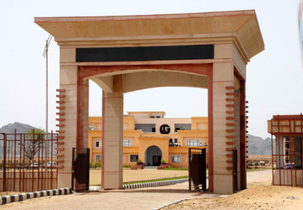 Campus: Realising the need for economic independence and the pivotal role men play in raising the standard of living of a vast strata of our society, Ajmer Institute of Technology, is providing career-oriented education to the students so as to equip them with requisite qualification and training. This institute of excellence aims at improving the quality of technical education to enable the students either to take up gainful employment or to start their own enterprise to gain economic prosperity. A well directed education is a passport to a good, comfortable and secured life. It will enable youngsters to become contributing members of society through their gained knowledge, skills and character development. We invite youngsters endowed with inquisitive minds and high professional aspirations, to come forward and join us to become significant MEMBERS of the Ajmer Institute of Technology. The AIT is fully alive to the needs and aspirations of the student community and keeps itself abreast of the changes taking place on the industrial and educational front of the country.